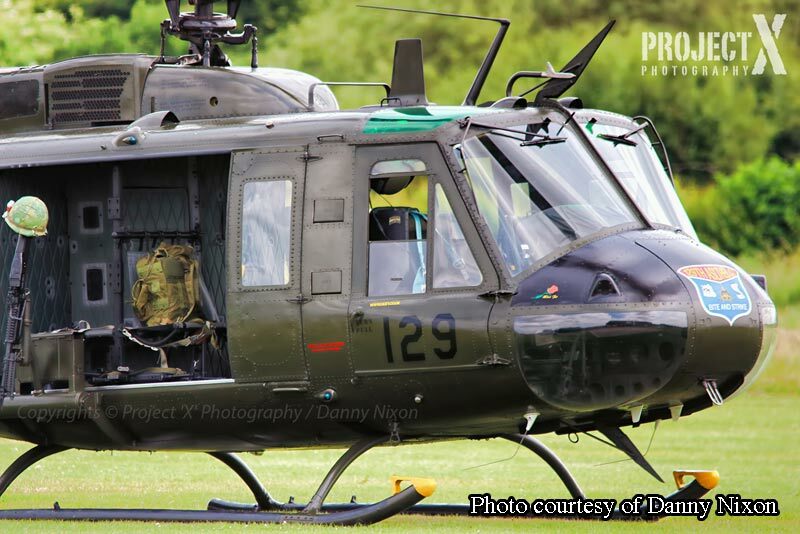 Manchester [Barton] Airshow 2015 took place on Sunday 5th July and Huey509 was invited to display. Team Huey arrived in the Motorhome at 07:00 hrs to set up the support vehicle and trade stand whereas Huey509 flew down to Barton with an ETA of 10:30hrs. 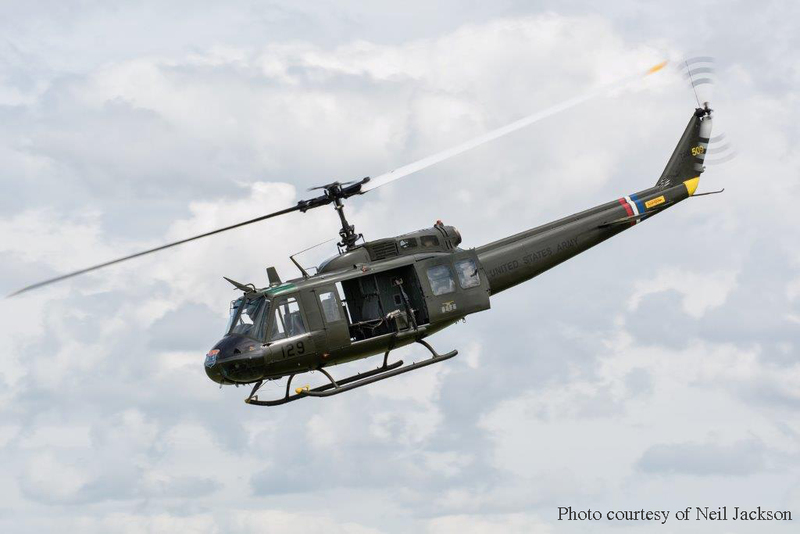 Huey509’s distinctive sound could be heard 5 minutes plus before arrival and apparently created a real buzz of anticipation amongst the aviation photographers! On arrival, I flew a recce of the crowd line markers and general layout of the site in preparation for the after lunchtime display slot. The sun was shining and it was a gentle off-crowd favourable wind so all looked good for the day. Huey509 flew like a dream and I really enjoyed showing her profiles during our turning display. 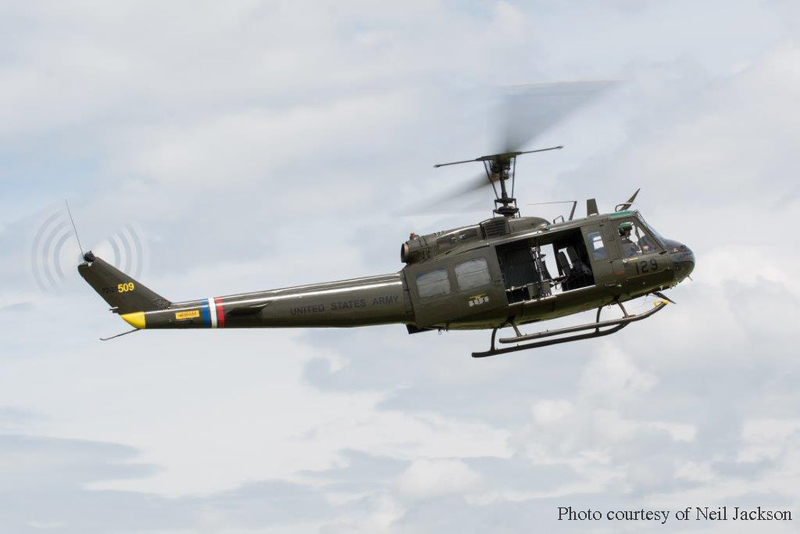 Huey has a fairly limiting flight envelope being of a teetering rotor system. This old design rotor system is very stable and you have to go against it to make it turn and twist. 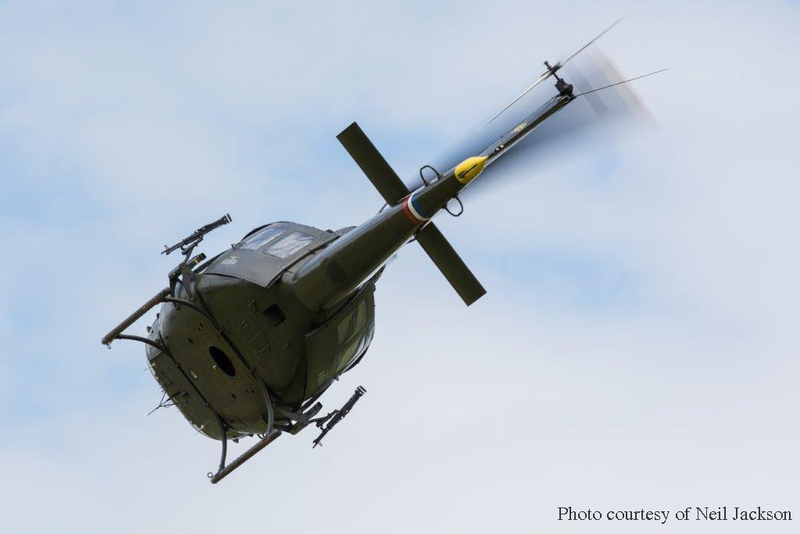 The flight envelope limits for any teetering rotor Huey are 30 degrees nose up and nose down with a maximum of 60 degrees angle of bank. Absolutely NO negative G load on the rotor blades so it’s always a wing over, turning display we fly with this 43 year old combat veteran lady. Later in the day and after our display, Mother Nature decided to throw a rain storm at Manchester and we had a downpour combined with strong winds for around an hour which unfortunately, proved to be a real show stopper! With just two aircraft left to display, sadly the Airshow stopped and people started to vacate the event. It has to be said that notwithstanding the downpour, it was a really great Show and the crowd enjoyed all that the event provided. We from Team Huey would like to thank the Manchester Airshow Organisers for a fabulous event and hope to be invited back next time. After a twenty year absence of an air show at Barton Aerodrome, 2015 saw the return of such an event. We were approached at the Huey team to see if 509 could attend; the answer was yes. Huey 509 is no stranger to Barton nor is our Chief Pilot Neil Airey. Huey509 has landed several times at the airfield during training flights whilst Neil on the other hand often flies the North West Air Ambulance from there. The date was set for the 5th of July. Jo Connolly, Nina and I were taking the Huey shop so set off early on the Sunday morning. We were slightly delayed because of road works on the M60 but nothing to worry about. We were directed to our pitch and soon had the motor home parked up and the awning up. Shop stock was set out on the tables and we awaited the arrival of 509 with Neil at the controls. His landing time was 10.30 hrs and around ten minutes ahead of schedule he was given permission to make a couple of circuits, much to the delight of everyone on site before landing. He landed at the eastern end of the airfield about a hundred yards from us. This made it more interesting for those coming to take a look at the shop as they could see 509 relatively closely. We had a constant flow of people coming to have a look and to have a chat about what we do and our aircraft. 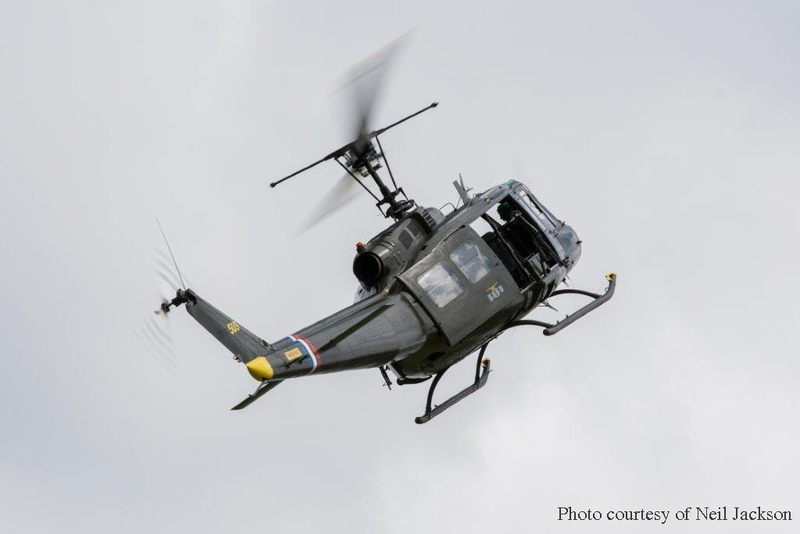 We never tire of talking about our aircraft, some have even accused us of being Huey bores ... how could they?! The air display kicked off on time and there was a good variety of aircraft taking part and some I hadn’t seen before, not least the Short Skyvan owned and operated by the Bronco Display Team. During the display a gentleman walked up to the shop and had a look at our patches, etc. It was only when he was walking away we saw a Vietnam Veteran baseball cap on his backpack. Nina ran after him to bring him back so we could talk to him. 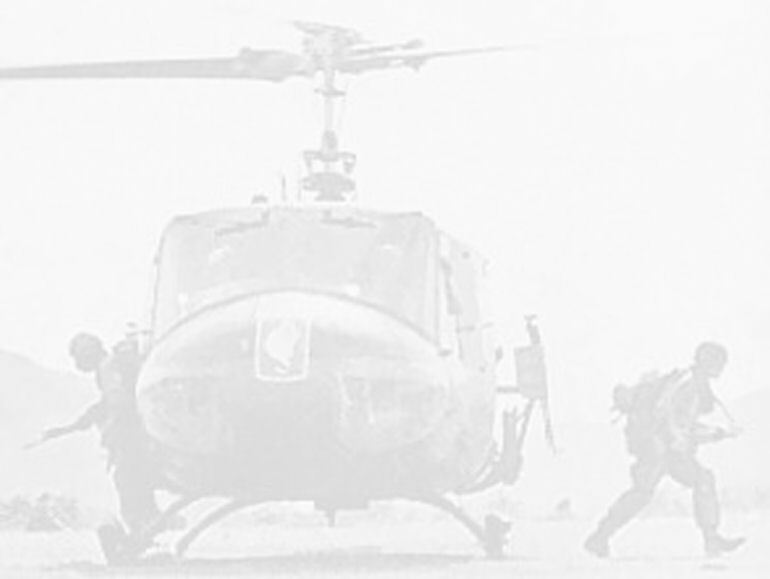 It turned out that John Harris had flown Sea Knights in Vietnam with the HMM364 Purple Foxes. They were a Marine Corps support helicopter unit. We had a long chat with him and when Neil returned we took him out to the Huey for a closer look. He had not flown a Huey during his service but it certainly brought back a few memories for him. Also giving displays were the Buckmeisters, Pitts Special piloted by 27 year old Lauren Richardson and Peter Davies who always gives a great display in the Gyro copter. Add to that mix the BBMF Spitfire and Hurricane and one of our favourites the RAF Chinook that gives a most extraordinary display. All were giving it there all with some very nicely worked out and impressive displays including obviously our very own the Huey thumping around. It all came to a shuddering halt when the wind picked up dramatically and the skies opened with torrential rain. Many tried to wait it out, sheltering where they could but the wind and rain showed no sign of abating, so even the hardiest of event goers had to call it a day. It was such a shame that the first Air Show at the City Airport (Barton) had to finish that way, but it had been a great event and will have left many wanting more. Fingers crossed for an even bigger air show next year. Our thanks to the Organisers of Manchester Air Show / City Airpot (Barton).